I made the experience that many radio amateurs give up, if the first mathematical equation cropping. But that does not have to be. On this webpage I offer the calculation of simple circuits and other things from the range of radio amateurs as forms. Their use is easy, so each one can use it. If you want to know, how looks the equations used into the scripts, then see the mathematical background at the end of each webpage. But only rarely resistances are available in the computed values. Change on the specified page the calculated resistances against from you used and see, which deviations with it to arise. If larger power must be processed, you can use the calculation of power attenuators to determine additionally the necessary power dissipations for individual resistors. At the attenuators were used so far, the input and output impedances are equal. However if different impedances must be adapted somehow, it can be also used resistors for it. The calculation of the loss arising inevitably with it determine the calculation of attenuators with minimum loss. Since no coils or capacitors are used in the three circuit above, the matching takes place frequency-independently. Attenuators are suitable therby for the wide-band matching. Sometimes it is necessary to divide an output signal on several building groups. Also this is realizable with resistors. The calculation of the loss arising inevitably with it determine the calculation of signal splitters. Since no coils or capacitors are used, the matching takes place frequency-independently. Attenuators are suitable therby for the wide-band matching. Mechanical small resistors are provided with a code in the form of color bands. For resistors with three or four color bands, the first two color bands denotes the value. The third color band denotes the multiplier and the fourth color band denotes the tolerance. For resistors with five color bands, the first three color bands denotes the value. The fourth color band denotes the multiplier and the fifth color band denotes the tolerance. You can ascertain with the color code calculator for resistors the value and tolerance. Capacitors are available with twelve values per decade. However sometimes values are required, which are not produced as norm values. You can calculate the value of the capacitor, which results from the parallel or series connections of up to five capacitors. A variable capacitor is rather rarely directly applicable in a circuit. If the tuning range is too largely and/or the initial capacity is too small, the desired values can be reached nevertheless by two additional capacitors. Frequently this is used as so called band spread in a VFO. You can use the calculator of the band spread. But only rarely capacitors are available in the calculated values. Change on the specified page the calculated capacitors against from you used and see, which deviations with it to arise. Every now and then resistors must be connected. With ohmic resistors the calculation is simple. The calculation of parallel and series connection of reactances is a little more difficult, but possible under the same rules. With it you can calculate reactances with two coils, two capacitors or one capacitor and one coil. The components can thereby also contain resistive components. Important elements are coils and capacitors, particularly if they appear together as resonant circuit. The calculation of resonant circuits determine mutually the frequency, the inductivity and the capacity of a tank circuit. By the way also the impedances of the circuits will be calculated. That are equal to the inductive reactances of the coils and to the capacitive reactances of the capacitors. Circuit groups with different resistances can be connected with less loss over a coil and a capacitor. The values of the LC networks determined with the calculation of match of resistances are valid always only for one frequency, since the used parts are frequency-dependent. But it is not necessary, lest the output resistor is a resistance. It can be also a reactance. The script calculate only LC networks with low-pass characteristic. Such LC networks are in use in antenna tuners. The values of the LC networks determined with the calculation of match of reactances are valid always only for one frequency, since the used parts are frequency-dependent. The level indication at instruments with an output or input of 50 Ω takes place usually in decibels relative to 1 mW (dBm). The indication in watts (W), milliwatts (mW) or microwatts (µW) is often important for amateur radio operators. A conversion of power into each other are possible with a small javascipt. In addition you can convers power and voltage at 50 Ω hear. It's possible to calculate the distance between two places on earth is possible, if you know the geographical latitude and longitude of both. In addition, it is possible to convert a locator in the geographical latitude and longitude. All electronic components generate heat which must be dissipated in order do not to destroy it. In some cases the surface of the device itself is sufficient, in some other cases an additional heatsink is required. 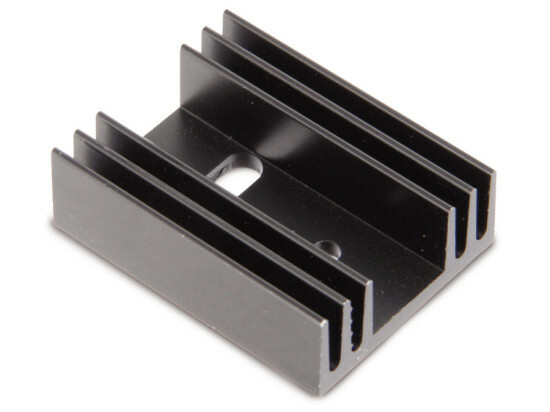 A few technical data are taken from the datasheet and the ambient temperature are only requires for the calculation of the thermal resistance of a heatsink. Thereafter, you can select a suitable heatsink from the assortment of electronic traders.